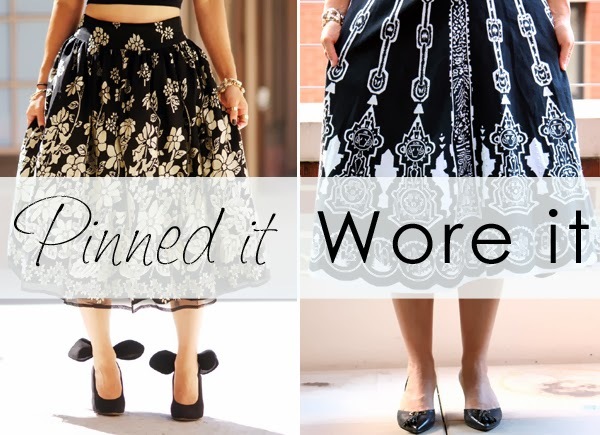 Let's grapple with two trends in one - print skirts and full skirts - with our latest edition of Pinned it/Wore it, my ongoing series about turning Pinterest fashion into a real outfit. 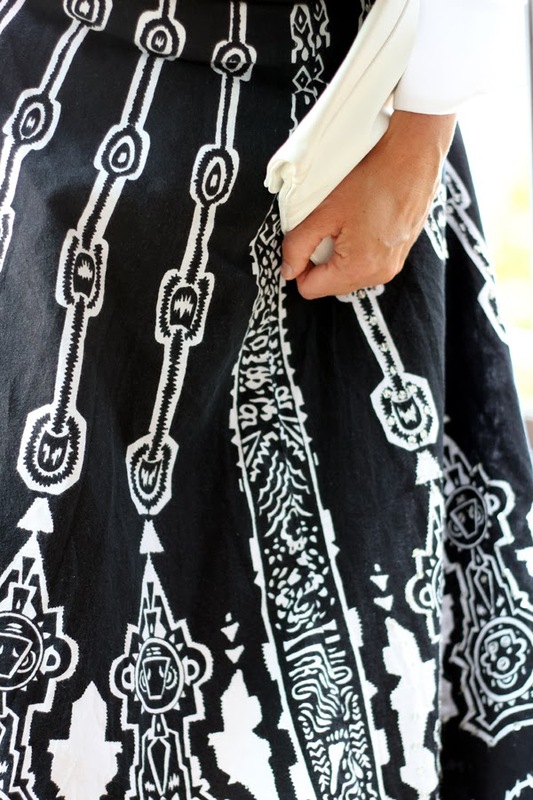 Here's my pin - a lovely full print skirt seen at Hallie Daily. Thanks to this pin, I picked up a peasant-y print skirt that I would normally pass by on my thrifting rounds, as seen below. The thing with a full peasant-type skirt is to not pair it with a peasant blouse or a yoke of oxen. Play against type. Hallie's tummy-baring crop top was not going to work for me. 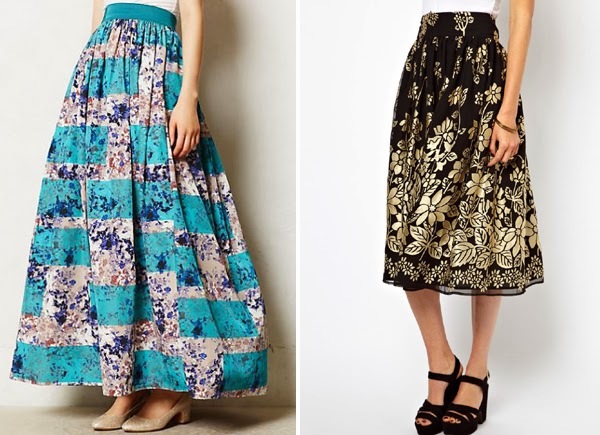 Below are a few more ways to wear a full print skirt. With a tank and stappy sandals like Aimee Song via Elle.com. Or with a jacket and killer heels like Hallie at Hallie Daily. Or a crisp blouse and jacket as seen at Refinery 29. Another chambray shirt paired with a crazy print full skirt via Purse Blog. This skirt seemed to do best for me with a crisp blouse and relatively delicate shoes. The killer heels and/or jacket thing was not so good. This violates the third rule of Pinterest fashion - trying too hard. You can do a full skirt or funky shoes or a moto jacket. You can't do all of them at the same time. Moto peasant has just not caught on yet where I live. Tip for puffing out your full skirt - wear another full skirt underneath. I stole this idea from Hallie the queen of full skirts. A tip from me: Look for puffy stuff in the fancy dress aisle of your local thrift store. There you will find taffeta and tulle in abundance. 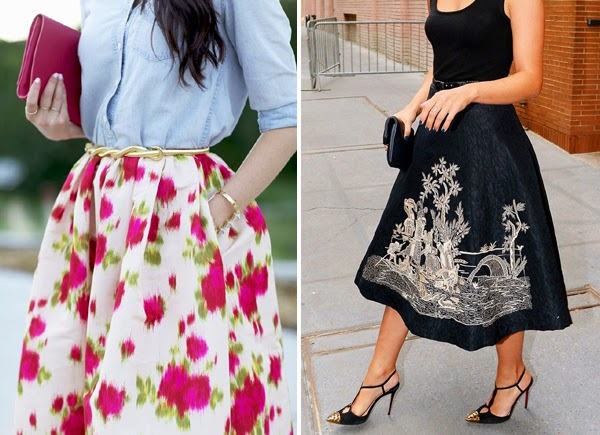 Hem the puffy skirt to be shorter than your print skirt. 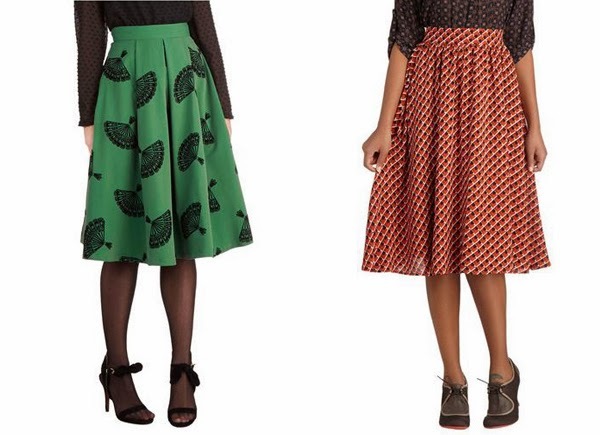 So, where to find a print full skirt? It's not so easy unless you are willing to spend hundreds of dollars on high-end design. Apparently this trend has yet to trickle down to regular retail level. Below are a few options in the more affordable range. Modcloth full green skirt. 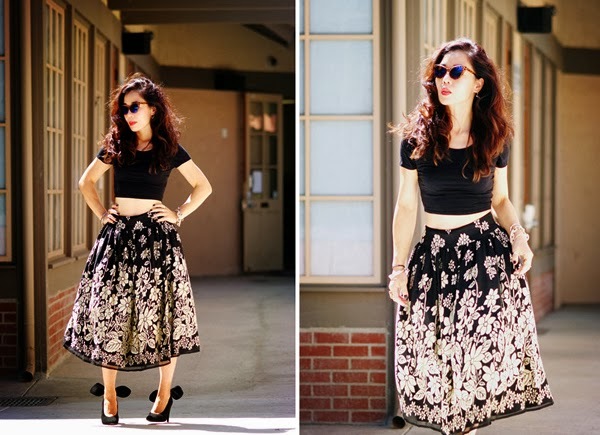 Modcloth Lakeside Manor skirt. Since this is a retro look, your best bet may be the same place I found my skirt - a thrift store. Would you attempt this trend? 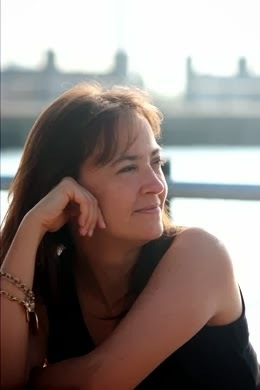 Sam, I hope you had a lovely Christmas and may all your wishes for 2014 come true!